A wild baby bird's best chance for survival lies in leaving it with its parents. However, if you find yourself in possession of an orphaned nestling or fledgling, you need to get the bird to a licensed wildlife rehabilitator immediately. Raising baby birds takes more than some birdseed. For example, songbirds require feedings every 15 minutes to half an hour from morning until night. Even pigeons and doves, which are much easier to feed than songbirds, require the right food warmed to the right temperature. Eventually, if the bird survives, it will need to learn how to eat on its own. The following protocol is for songbirds, shorebirds and pigeons and doves. Raptors require far more intricate care. Feed baby birds an appropriate diet for their species. For example, the diet of a baby dove will consist of a grain-based formula such as Kaytee Exact, but a baby grackle requires a mash high in protein. Many baby birds are fed regurgitated food straight from the parent's mouth, so the texture of the food needs to be a mash or gruel for most small babies. The exception to this would be semi-precocial species such as gulls, terns and songbirds. In this case, the parents catch and feed small fish, crustaceans and insects to the birds, so these birds can be fed small minnows and crickets when very young. As the bird begins to transform from fuzzy to feathered, start adding appropriate solid foods to its mash or formula. When the baby bird is nearly fully feathered, you may start placing solid food in the bird's enclosure for the bird to investigate. Offer foods that are as close as possible to what the bird will find to eat. For example, if the bird is an insectivore that you have been feeding catfood, start offering live mealworms and crickets. If the bird is a tern, gull or heron that you have been feeding frozen fish, it is time to try a shallow water dish filled with live minnows. Eventually, the bird should start pecking at the food out of curiosity. Once the bird begins to eat on its own, start cutting down on hand feeding. If you happen to be rehabilitating older birds of the same or similar species, moving the babies in with the older birds is a great way to teach a baby bird how to eat on its own. Once the bird is fully feathered and starting to self-feed, it should be moved to an outdoor enclosure to get used to the sights and sounds of nature. At this point, the bird should be eating a diet as close as possible to what it will find to eat in the wild. This may require you to collect edible wild berries, hunt wild bugs and fish in local waters. When the bird is self-feeding and no longer "begging" for food, you may perform a "soft release." This means you open the cage door. This way, the bird can leave when it is ready, but will still have open-door access to its cage. Sometimes, you can simply place some food or water outside near the bird's enclosure. Chances are the bird will come back for food and water and possibly shelter for at least a little while. If you have not seen the bird for a few days, you can assume it has successfully made the transition to wild. 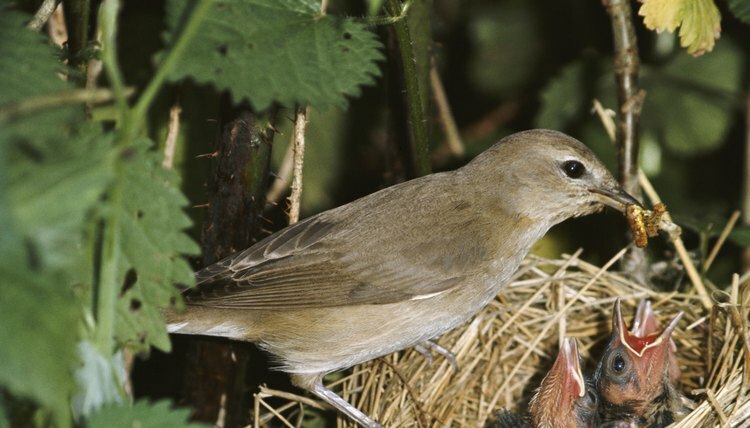 Some birds are precocial, meaning they know how to eat on their own immediately after hatching. In this case, the parents or wildlife rehabilitator simply needs to provide the correct food. Ducks and quail are examples of precocial birds. Not all baby birds "beg" for food. A lack of begging alone does not necessarily indicate that the bird is not hungry or is eating on its own. What Do Baby Birds Eat? When Can a Mockingbird Fly?